• The DiaTiN coating is a combination of TiN coating with DLC (Diamond Like Carbon). • Surface hardness of 3,000 Vickers (standard TIN bit approx. 2,500 Vickers). • DLC coating improves wear resistance and lengthens the life of the bit. • It reduces the force required for implementation. • Greater speed of implementation on the job. 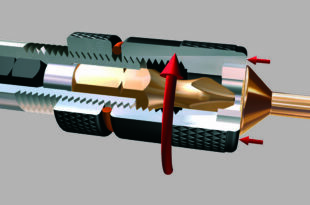 • Quick lock attachment for optimum holding in the chuck. • The torsion geometry combined with the TiN coating increases the resistance to tightening torque. • Fully compatible with PL, PH, PZ, TX type screw.